Thank you for the interest on the massage I offer. For appointments simply provide me your requirements for a massage session. Example: relaxing, relieve tension, Improve flexibility, etc. I also need to know your location and preferred time for the treatment so to balance my entire schedule with my clients. Services include a 1.5-hour (90-minutes) of massage guaranteed professionally done in the convenience of your own home. You may choose a massage that best suit your needs. Generally a full body massage using oils. The usual sequence is Effleurage (Gliding long stroke movements), Petrissage (kneading), Friction, Vibration and Percussion to manipulate the superficial layers of the muscles to improve mental and physical health. Active or passive movement of the joints may also be part of the massage. The benefits of Swedish massage include increased blood circulation, mental and physical relaxation, and decreased stress and muscle tension. Is a massage technique that focuses on the deeper layers of muscle tissue. It aims to release the chronic patterns of tension in the body through slow strokes and deep pressure on the contracted areas, either following or going across the fiber's of the muscles, tendons and fascia. he purpose is to "unstick" the fibers of a muscle while releasing deeply-held patterns of tension, removing toxins, while relaxing and soothing the muscle. It is both corrective and therapeutic. A type of Oriental bodywork therapy that is based on the treatment of the human body, mind, and spirit. The actual massage consists of slow, rhythmic compressions and stretches (bending and stretching) along the body's energy lines.This therapy increases flexibility and range of movement and promotes a deep sense of relaxation with an increased energy level. Derived from the word "shi", meaning finger, and "atsu", meaning pressure) is a traditional hands-on therapy originating in Japan. It involves applying pressure to special points or areas on the body in order to maintain physical and mental well being, treat disease, or alleviate discomfort and also known for its ability to clear the energy pathways. 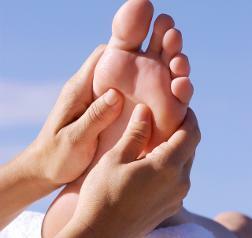 An ancient art of healing by stimulating predefined pressure points on the feet. This controlled pressure alleviates the source of the discomfort. In the absence of any particular malady or abnormality, reflexology may be as effective for promoting good health and for preventing illness as it may be for relieving symptoms of stress, injury, and illness. Hot stone massage is a variation on classic massage therapy. Heated smooth, flat stones are placed on key points on the body and use them to massage certain areas of the body. The heat from the stones relaxes muscles, increase the blood flow to the area being worked on which further accelerates the healing process. This increase in circulation and the relaxation of the muscles also aids in mental relaxation. Mental relaxation is key when a Therapist is attempting to work into deeper muscles of the body. A Balinese massage uses a combination of techniques like kneading, skin rolling, gentle stretches and acupressure using aromatherapy oils to boost your improved circulation and give optimum relaxation as well. 8. COMBINATION OF THE ABOVE MASSAGE TREATMENTS.